VANCOUVER, Nov. 20, 2018 /CNW/ - Bonterra Resources Inc. (TSX-V: BTR, OTCQX: BONXD, FSE: 9BR1) (the "Company" or "Bonterra") is pleased to announce that the Gladiator mineralized trend has been extended to over 4.5 km as a result of new drill results as well as new information gained through the Duke joint venture database. Drilling by Bonterra and by the previous owner of the Duke ground (Beaufield Resources Inc., now Osisko Mining Inc.) has resulted in Gladiator deposit extensions in both the east and west directions. Drill hole BRS-17-11 was completed in 2017 by Beaufield in proximity to the Beaufield/Bonterra claim boundary approximately 2 km northeast of the known Gladiator deposit extent. This drill hole crossed into Bonterra claims at approximately 300 m depth below surface and encountered a broadly altered and mineralized zone that was identical in characteristics to the Gladiator deposit including the presence of visible gold. The hole was logged and sampled by Beaufield; however, it was not reported to Bonterra and it is unclear whether assays were obtained at the time. Since the Duke option deal was ratified with Beaufield, Bonterra has been able to retrieve the core and resample it resulting in an intersection of 7.7 g/t over 3.0 m. Additional holes obtained from the Duke database as well as new drilling completed by Bonterra have confirmed the extensions in both the east and west directions. Bonterra is now drilling follow up holes in and near the Duke option southern boundaries as it is now earning in to 70% of this ground from Osisko Mining (see BTR news release dated May 23, 2018). 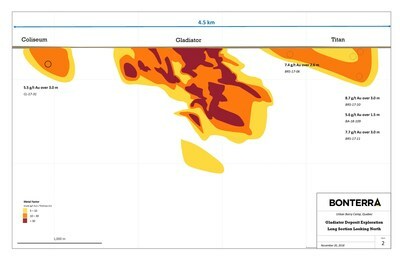 - BRS-17-10 and BRS-17-11 were historic and re-sampled intervals indicating potential extensions of the Gladiator deposit to the northeast of up to 2 km with 8.7 g/t Au over 3.0 and 7.7 g/t Au over 3.0 m, extending the total Gladiator trend to 4.5 km. - CL-17-31 intersected 5.5 g/t Au over 3.0 m at Coliseum zone 1 km to the SW of Gladiator deposit. 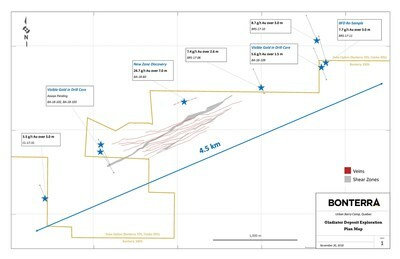 - BA-18-109 intersected 5.6 g/t Au over 1.5 m at the new Titan zone confirming the mineralized structure NE of Gladiator deposit. The Coliseum Zone extension occurs 1 km south west of the Gladiator deposit along strike with 5.5 g/t Au over 3 m in a mineralized shear zone. The Titan Zone extension has been discovered 2 km northeast of the Gladiator deposit with results such as 7.5 g/ t Au over 3 m with visible gold hosted in a smoky quartz vein. The Titan zone is defined to date by 5 drill holes, 4 of them displaying visible gold. These two mineralized zones have structural and geological similarities to the Gladiator deposit and are on strike in both the east and west directions. Two rigs are currently in operation to expand the footprint of the known mineralization. The Titan zone and Coliseum zone remain open in all directions. **Drill hole previously released (see Beaufield news release dated October 16, 2017). Nav Dhaliwal President and CEO of Bonterra stated: "Bonterra is consistently demonstrating the potential of gold discoveries on its land package in the Urban Barry Camp. The full potential of the Gladiator deposit and area can now be fully realized utilizing the complete land package consisting of the Duke option together with the original Bonterra lands. The recent results show that Bonterra is not only controlling several known gold deposits but sits on a major gold bearing structure that has not been fully exploited yet." Bonterra estimates that the true thickness of mineralized intervals is between 60-80% of stated core lengths. No capping grade has been applied. NQ-sized drill core is saw cut with half of the interval sampled for analysis at ALS Laboratories in Val d´Or, Quebec and the remaining half is stored at the Gladiator project site. Sample intervals are selected based on geological criteria including lithology, mineralization and alteration. Blanks and certified reference standards are inserted every 25 samples. The company employs a QA/QC program consistent with NI 43-101 and industry best practices. 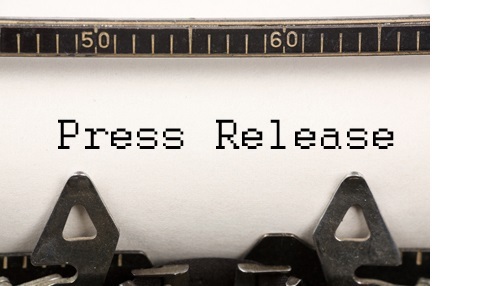 Pascal Hamelin, P.Eng., has approved the information contained in this release. Mr. Hamelin is the Chief Operating Officer of Bonterra´s wholly-owned subsidiary, Metanor Resources Inc., and is a Qualified Person as defined by NI 43-101.